The mango originated in South and Southeast Asia. The word evolved from Tamil, the most important Southern Indian language. Manpalam means ripe mango, and mangai refers to an unripe mango. It is believed that the word mango was carried west by Portuguese sailors who found the unripe mangai in harbor markets and brought them home with them. From Brazil, the fruit spread to the West Indies and the Dominican Republic. It reached Jamaica around 1782 and then, early in the Nineteenth Century, made its way to Mexico from the Philippines and the West Indies, and from there made its way to Florida. My first real experience with a mango (I may have previously encountered an unripe slice or two as a garnish) was around 1978, when I went to Puerto Rico for two weeks. I went to visit a friend who was, in turn, visiting friends. It was an amazing, incredible experience for many reasons, not least of which was when we rented a car so we could drive around the island and explore. It's a small enough island that we were able to drive around the coast from the north side of the island, where we were staying in San Juan, to Ponce in the south, then cut through the middle of the island back to San Juan, in one day. The next day we did the same thing heading east instead of west, so we basically covered the whole island in two days, with plenty of time to stop and see some sights. Dotted along the coastal roads around the island, in addition to the beautiful red-flame-flowering flamboyan trees for which Puerto Rico is known, we saw many mango trees. Our companions suggested we stop at one and we gathered several of the ripe fruits that had fallen to the ground. We peeled them with our teeth and fingers and ate them out of hand right there on the side of the road. They were the sweetest, juiciest, most flavorful fruit I had ever tasted. We feasted on fresh mango for the rest of our visit, and I have eaten them ever since, waiting for them to come into season and eating as many as I can before they disappear again. It is not well known, however, that unripe mango gives a remarkable spice much used in Northern India. The stone removed, the fruit is cut in slices, dried and afterwards ground to a pale gray powder. This powder is used frequently instead of tamarind, the other important sour element in Indian cuisine; mango powder is, however, much weaker than tamarind and has a subtle, resin-like taste. It is mainly used when only a hint of tartness is desired or when the dark brown colour of tamarind is to be avoided. 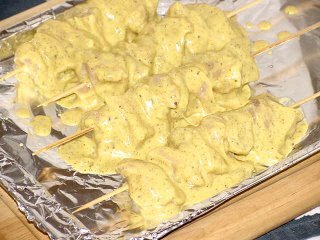 Mango powder is generally more popular with vegetables than with meat, but is frequently found in tikka spice mixtures for barbecued meat. 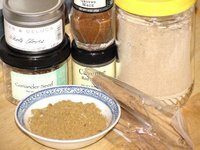 When I was looking through Jill Norman's Herbs & Spices for something I had never used before for Barbara's next Spice Event at Tigers & Strawberries, my attention was immediately caught when I noticed Amchoor (Hindi), or Amchur (Marathi). As much as I love mangos I couldn't resist the idea of dried mango powder. And when I discovered that it was a key ingredient in tikka spice mixtures, I was sold. Chicken Tikka Masala is one of my favorite Indian dishes. I knew I had to try it. But where to find it? I knew I wouldn't find it in my neighborhood grocery stores, although Treasure Island carries a broad range of European and imported goods. My usual spice shop didn't have it listed in their catalog or online, so I knew I would have to venture up to Devon Street to look for it in one of the Indian grocery stores there. So last Sunday evening Jessica and I sallied forth to find amchoor and dinner. Devon Street in Chicago is packed with Indian restaurants and grocers. Early on a Sunday evening there are hundreds of people congregating on the street and in the restaurants. It was a little intimidating because I felt like I stood out as a non-Indian. Jessica has fair red hair that made her stand out even more, and we received more than a few appraising glances from people as we passed them on the street. I found my spice at the World Fruit Market, the second place we stopped. Jessica actually found it, a large packet labeled Amchur, which I guess must be the Northern Indian word for it. It's in the jar on the right in the picture above. I bought it, along with about eight pounds total of red and yellow lentils (what was I thinking? ), and then we looked for a restaurant for some dinner. We settled on Mysore Woodlands, a Southern Indian vegetarian restaurant. It was bustling, so it seemed like a good choice. I'm not terribly familiar with Southern Indian food, so I didn't recognize much from the menu. They had a combo special that Jessica and I both opted for. What we got were big round trays topped with small silver bowls full of all kinds of strange and wondrous things. The only real problem was we had no idea what anything was. Some of the bowls seemed like sauces and condiments but we couldn't tell which was which. There was one dish that had lemon peels and garlic that was delicious. If anyone knows what that was, please let me know. The food was good, but the service was so-so. While I would go back, I think I'd rather try some of the other Indian restaurants in the area. So the next day I roasted up my whole spices and ground them up with other spices and the amchoor into a Tandoori Masala. It smelled fresh and roasty-toasty and I couldn't wait to use it. 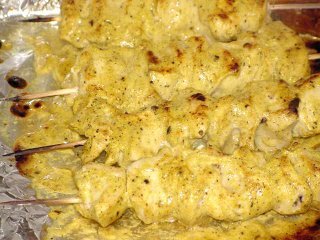 I added a tablespoon of the masala to a cup of plain yogurt and marinated some cubed chicken in it overnight. The next day I soaked some bamboo skewers in water for an hour, then I put the chicken cubes on the skewers and broiled them for about ten minutes on each side. The result was delicious. I cooked brown Basmati rice with chicken stock and added a teaspoon of the amchoor and about half a teaspoon of mace. The rice didn't fluff up as much as I had hoped, but it tasted wonderful, especially with the chicken tikka. Crush the cinnamon lightly and dry-roast the whole spices until they darken and start to smoke. Let cool, then grind them. Combine all the spices with the salts. To use, stir scant 1 cup plain yogurt and combine with 2-3 tsp of the masala. Cut the chicken into 2-inch cubes. Whisk the yogurt and stir in the masala and the oil. 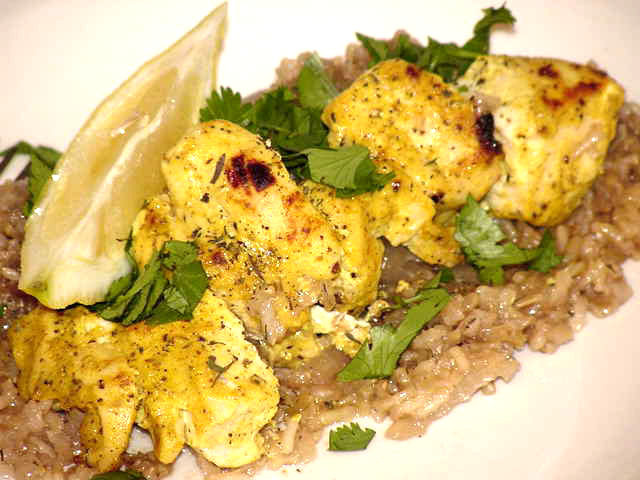 Marinate the chicken in the yogurt for at least 2 hours. When you are ready to cook, heat the oven to 450 degrees F., or heat the broiler or a charcoal grill. Thread the chicken pices onto skewers. 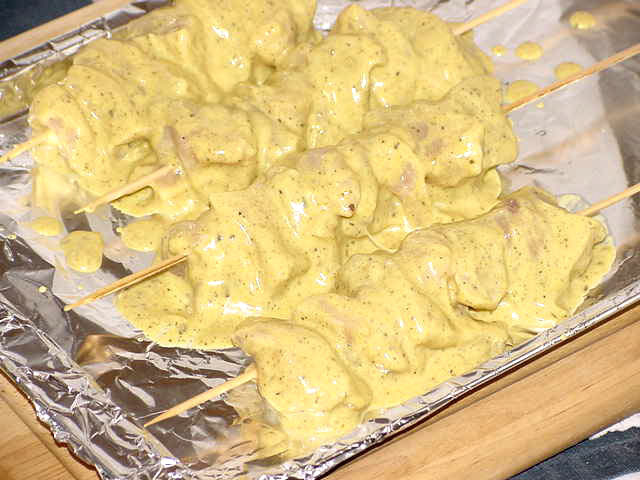 Bake the chicken for about 12 minutes, or broil or grill for about 10 minutes, turning the skewers once. Serve with lemon wedges and chopped cilantro or mint.